Updated: 7 p.m. | Posted: 12:26 p.m.
Minnesota's struggling moose population, which has nearly disappeared in the northwest corner of the state and declined by nearly 60 percent in the northeast, may warrant protection under the Endangered Species Act, the U.S. Fish and Wildlife Service announced Thursday. Two environmental groups, the Center for Biological Diversity and Honor the Earth, petitioned the agency last year to protect the U.S. population of northwestern moose, found in Minnesota, Michigan, North Dakota and Wisconsin. In its finding, the agency wrote the petition "presents substantial scientific or commercial information that the petitioned action may be warranted." Placing the moose on the Endangered Species list is the best way to prevent it from going extinct in the state, argued Collette Adkins, a biologist and attorney with the Center for Biological Diversity in Minneapolis. "We've seen how the Endangered Species Act has saved the wolf, and I think it can save the moose too," she said. "Even though this is sad that moose need this protection, it's good news they're likely to receive it." The government now will undertake a "rigorous status review" of the petition before deciding whether to formally request to list the moose as threatened or endangered under the law. The finding "doesn't mean we're proposing to list it at this point, or making any kind of a judgment about the moose itself," explained Fish and Wildlife spokesperson Georgia Parham. "What we're doing is saying the petition itself gave us enough information to prompt us to move forward." The public has 60 days to comment on the review. Meanwhile a race is on to try to decipher what's causing Minnesota's moose to die at such an alarming rate. Three years ago state scientists began a landmark study using GPS collars to quickly respond to dead moose to learn what's killing them. The results, so far, suggest about two-thirds of moose collared by the state have succumbed to health problems like parasites and infection. The others have been killed largely by wolves, although many were already sick. Researchers suspect that climate change also plays a role. Minnesota is near the far southern edge of the moose's range. 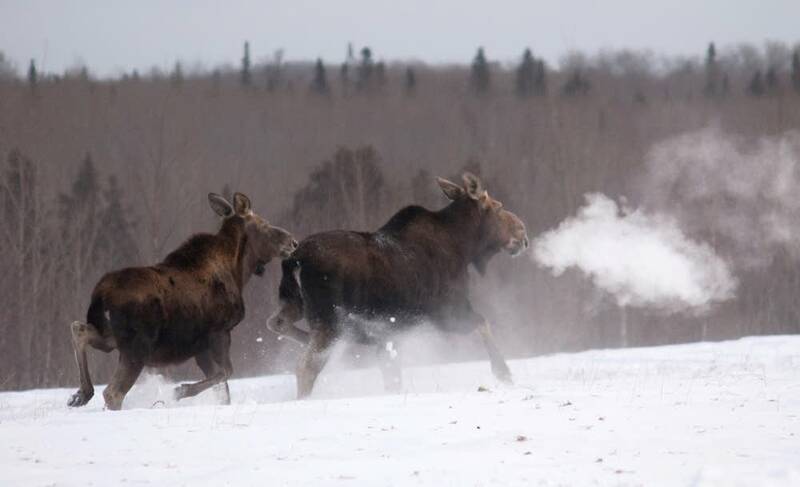 Warming temperatures, especially in the winter, may weaken moose and make them more susceptible to disease and ticks. The moose illustrates what Minnesotans risk losing because of a changing climate, the Center for Biological Diversity's Adkins said. "Listing under the Endangered Species Act would spur additional money and research for the moose," she added, "and would provide additional habitat protections that would help moose cope with this warming world." Thus far moose research and work to restore habitat in Minnesota has been spearheaded largely by the state and Indian tribes. Some worry the federal oversight of moose that would follow an endangered species act listing could restrict their role. "It challenges our ability to do research, it challenges our ability to implement management actions that might be useful for improving the population," said Seth Moore, a biologist with the Grand Portage Band of Lake Superior Chippewa. "In my opinion this may become actually a giant hindrance to moose restoration, rather than a help," Moore said. Federal protection would also prohibit moose hunting. A subsistence moose hunt has long been vital for the community and cultural health of the Grand Portage Band, Moore said. The state cancelled its moose hunt in 2013. The Grand Portage Band has followed suit, "but there's a significant difference in making that choice compared to being mandated to do so," Moore argued. "I really think it's a detriment to take that right away that has been established by treaty." The Minnesota Department of Natural Resources has not taken an official position on the listing petition. "Our focus is on gathering up information and submitting our scientific findings on the subspecies and its habitat," said Rich Baker, the DNR's Endangered Species coordinator, "so that the Fish and Wildlife Service's decision can be as robust as possible." That decision is potentially years away. The Fish and Wildlife Service has a backlog of about 500 other species in the same position as Minnesota's moose--species awaiting a full status review by the agency to determine whether endangered species act protection is warranted. "We are very, very far from that point," said the DNR's Baker. "Belaboring that point is really getting ahead of ourselves."